Has the banning of items used by people always led to those items becoming more expensive? First thought is the prohibition of alcohol but wouldn’t Gold also become more “expensive” or “valuable” if Governments were to ban the use or possession of it? What are your thoughts on that? With warm greetings from the Sunshine coast. ANSWER: If you ban something, it not necessarily the price that rises, it is the demand. 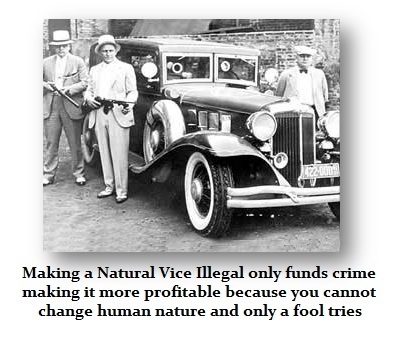 Drugs should be legalized to eliminate all the violence, exactly like what took place during prohibition. If government bans gold as they did in 1934, they will confiscate it this time around if someone traveled with it or used it in some transaction on the black market. They would probably not go house to house, but that is just my opinion. What value gold would have is hard to say. Without a quoted market, price becomes opinion, similar to diamonds. If Donald Trump or Carson is elected, I do not think we will need to worry about that. Elect a career politician and we will most definitely have to watch our back.